We are custom web designers for businesses throughout Virginia and across the USA. Every so often I prospective new website clients ask; ‘What makes your web designers different from all the others? What sets you apart? This is why I posted a ’12 point check list’ of what to ask, and what to consider when shopping your website project to different web design companies. We exhibit our unique design styles and execution by way of our client websites page. Over time we learned clients favored VISIONEFX for our bold design and online branding expertise. Chances are your website was built on an older technology. This alone is reason enough to have a new website. A. Web Concepts – We share, brain-storm, discuss design ideas with you to firm up the interface and creative direction of your website. B. Keywords and Search Phrases – We research , review keywords and search phrases using tools and methods to ‘search engine optimize’ your web site. C. Wire frame – We develop diagrams or a wire-frames to establish your primary navigation, establishing a road map for developing your web site framework. D. Design Comprehensives – We create + build website comprehensives for your review and feedback, to establish the look, feel and style of your web site. E. Website build-out – After your approval of the design comprehensives we start the web coding process. We will provide you a demo web address where you may view your website in production. We have multiple web design business categories covering over 200 sub categories representing multiple businesses; all of which can be viewed online via our website clientele tab. Each and every one of our designs have been customized and branded from scratch in Photo Shop. Each web design concept is branded to a client’s specific business, service or product. Our programmers are experienced in .NET SQL, (Dot Net) Tellerik, PHP MySQL, Word Press, Joomla, Fusion and many open source languages. We are also experience in legacy systems such as Classic ASP, AS400 or ACCESS db. 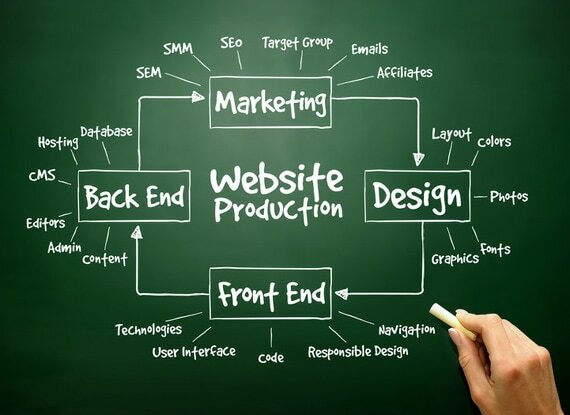 Our programmers write and develop website programming code customized to your database and web site requirements. Since we opened our doors in 2000 we have been performing website maintenance, search engine optimization, and other website enhancements. If a client wants to spend time growing their business instead of editing their website, they may contract VISIONEFX to be their ‘virtual webmaster’. YES. If someone ‘Googles’ for your services or products it is best to appear on the first page for any search query. Same is true for results on Bing and Yahoo. We use Google as our SEO benchmark where it is the most difficult to achieve high ‘SERPs’. (Search Engine Ranking Position) SEO is important because no matter how nice a website you have, if no one can easily find you on page 1 or 2 in the search engines you might as well have built your website in the middle of the woods. VISIONEFX can help you with light writing tasks for SEO purposes; however for the heavy lifting we have established a strategic partnership with website content writers experienced in writing for the web. In today’s online market place it has become imperative for a website to communicate creatively as well as be grammatically correct. From the creative point of view, your web copy or text must clearly convey your message to your visitors. From the search engine optimization (SEO) perspective, professional level copy writing yields ‘professional level search engine ranking’. Every live website contained in our live portfolio contains phone numbers, emails and contact forms, all available for anyone to inquire about our performance and reputation. We also have a TOP Google Reviews. Our clients have always been our most important source of referrals! We prefer and recommend that a client have 100% control of their hosting and domain. You should never put your domain name and website hosting in the control of another 3rd party. Web hosting and domain registration is relatively inexpensive. The yearly cost for a typical small business website hosting plan ranges from 42.00 to 120.00 per year depending on how many years you sign-up for. We will also help to guide you through this process. Whether you are a small business with 2 employees or 200 employees, our small business website will cost is the same. TIP! We recommend you write-up your website requirements as a ‘Request for Quote’ and send too two or more reputable website design companies. In most cases you will find our cost the lowest. SUMMARY – Consider that your website is one of the most powerful adverting vehicles that you have in your marketing arsenal. It is your 24/7 store front that is never closed. We are here to help you achieve a powerful Internet presence. We build powerful sites, for predatory markets.